Hotelogix is a Hotel Management System for small and mid-sized hospitality businesses. The system is a full-service solution encompassing all of the hotel/motel industry's daily activities, including reservations, front desk operations, point of sale terminals, and housekeeping management. Because Hotelogix is web-based, it allows hospitality facilities to benefit from its complete range of services without the need to invest in additional infrastructure or in-house software. Currently, the system is used in over twenty-five countries around the world and has an expanding global network of resellers. HMS Infotech, the makers of Hotelogix, formally introduced the system in Hotelogix 1.0 in Jan 2010, after a successful year-long beta period. HMS Infotech is headquartered in Delhi, India, and has twenty employees. Hotelogix has customers in 28 countries in regions including America, Europe, Asia Pacific, Middle East and Africa. Hotelogix recently won the #1 slot in the Top 8 SaaS AppS from NASSCOM EMERGE-Product Showcase, which seeks to highlight the top companies developing innovative applications. In 2008, HMS Infotech began developing Hotelogix using a dedicated server through a third-party cloud services provider. Shortly after, the company engaged in a complete migration to Amazon Web Services (AWS). Prabhash, the Founder of Hotelogix explains, "We chose AWS primarily for the flexibility it offers. Because we were at a growth stage, we needed an environment that could scale according to our changing needs and expansion." Today, AWS serves as Hotelogix's backbone. 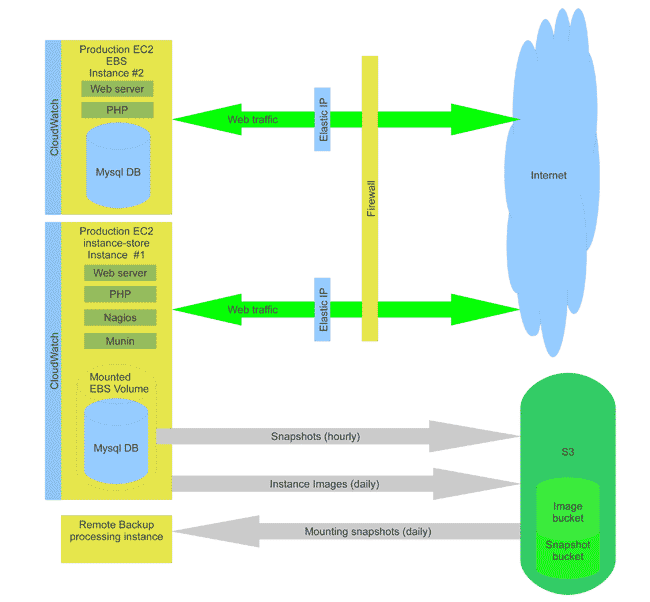 The system's production environment consists of two Amazon Elastic Compute Cloud (Amazon EC2) instances, with one of the instances utilizing both the local instance store and an Amazon Elastic Block Store (Amazon EBS) volume. The local instance store is dependent upon the existence of the Amazon EC2 instance, while the Amazon EBS exists independently from the instance to which it is connected. Hotelogix's database is housed in the Amazon EBS volume, and its file system is in the local instance store. The company takes hourly point-in-time snapshots of the database, and then sends one snapshot to Amazon Simple Storage Service (Amazon S3) for backup every day. Files within the local instance store are also backed up to Amazon S3 on a daily basis. Additionally, HMS Infotech utilizes Amazon S3 to store images from its Amazon Machine Images (AMIs), which are used to create virtual machines for application testing and deployment in Amazon EC2. Since migrating to AWS, HMS Infotech reports an overall savings of forty percent on compute and storage services. The company is also experiencing a fifty percent reduction in the cost of creating testing environments, compared to its previous cloud services provider. In addition to lowering its operational expenses, Amazon EC2 allows HMS Infotech to conduct frequent Hotelogix upgrades with parallel installations that dramatically reduce customer downtime. As Hotelogix continues to grow in popularity within the hospitality industry, HMS Infotech may further enhance its Amazon EC2 instances by placing them in availability zones or regions and employing the auto scaling feature as the system's traffic increases. The company is also considering moving some of its data storage needs to Amazon Relational Database Service (Amazon RDS), as well as incorporating Amazon Elastic MapReduce for large-scale data processing. HMS Infotech is pleased with Hotelogix's rapid introduction to the market and looks forward to the system's continued adoption into new hospitality venues across the globe. Prabhash Bhatnagar, HMS Infotech's founder, says, "Building our enterprise cloud services for hotels on the AWS backbone has helped us dramatically reduce our development cycle, and it gives us the flexibility to quickly scale our infrastructure resources and manage the fast changing requirements of our current high growth rate."